Editor’s note: Children of parents with mental illness are at higher risk for developing mental illness themselves. The risk is particularly significant among parents with bipolar disorder, ADHD, anxiety and a host of other disorders. My own family has schizophrenia, bipolar disorder, anxiety, and alcoholism. My son has ADHD. Erica Sokol, Program Director of NAMI Dupage, comes from a similarly marked gene pool. Her experience and knowledge are both educational and inspiring. Perspective is a powerful tool to the human race. Our perspective allows us to define how we interpret and assign meaning to life. We can choose to allow something to be a negative or a positive influence in our lives or an opportunity to grow and learn. Life provides a range of experiences, and we get to choose how we respond. My earliest memories of school were feeling out of place, as if I did not belong. My self-esteem was very low. I struggled with phonics, grammar, reading, spelling, and math my entire academic career. I felt ashamed because of my learning disability and, later diagnosed, ADHD. I was drawn to art and science but most of all I loved to question life. I enjoyed inventing things and problem solving as a child. Luckily, by high school, I had learned my strengths and how to juggle my disability. After high school, I went on to community college and earned an Associate Degree in Landscape Design. Later I went back to school to earn a Master of Science in Clinical Psychology and currently practice as a Licensed Professional Counselor. During my journey, I never felt I had to blame anyone for the learning disabilities or ADHD. My father has had many of the same academic challenges and it would seem as if my genetic link could be traced to him. But I choose to focus my energy on the things I can control in my life. I cannot control the genetics given to me, nor do I allow them to define me. When we label ourselves with diagnoses it is like casting a shadow on our true self, blocking our strengths. I know that, after educating myself, I often wish my parents knew more about neuropsych testing and the importance of an accurate diagnosis so that I would have received better treatment. I do not blame them; I know they did the best they knew how. Now, my youngest daughter has been diagnosed with ADHD, learning disabilities and speech delays. I see her struggle and often she comes home crying, “I am not smart.” What I can focus on with her are her strengths and areas that she feels she can be successful. Giving her a sense of succeeding in other areas hopefully will create a seed of power and the strength to reach her dreams. Currently, I would bet at times she would like to blame me for the genetics she has been given. I can’t say that I don’t blame her; our journey can be difficult and finding your way can feel very hopeless and embarrassing at times. My hope is that I can give her what she needs to develop a healthy perspective. Parenting for my daughter means I have to be her advocate. I have to remember to be mom and not her counselor, which comes easily as a result of my training. As her mother, it is my job to support her in her strengths and love her unconditionally. It is my job to find a trusted team of professionals which meet her needs and communicate with her team at school. Mental health concerns, like other medical diseases or illnesses, have been suggested to have three factors that contribute to the onset. The Biopsychosocial model has been used by the health care community to explain the factors that contribute to disease. This model suggests that disease/illness is not “linear, cause-effect” (Smith, 2002) but that a combination of factors contribute to the onset of illness. The model is also used for recovery, prevention and early intervention of conditions. 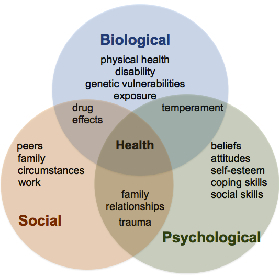 The three factors in the Biopsychosocial model are biological, psychological and social. Biological factors are defined as genetic vulnerabilities, general medical conditions, neurochemicals, traumatic brain injury and brain defects. Psychological factors include beliefs, attitudes and personality. Social factors include environment, experiences, support systems and trauma. Science has shown that genetics play the largest role in the onset of disease; however, psychosocial factors can play a role in the severity of the diagnoses. Some research has even suggested that the environment can alter genetics! (That’s a topic for another post.) Learning disabilities and ADHD are strongly linked to genetics though research has suggested that the environment and nutrition play a role in the severity of the symptoms. In my story, there are three generations of learning disabilities and ADHD. How each individual manages the symptoms is largely based on psychosocial factors such as personality, belief systems, support, nutrition and environment. For example, my father and I could have the same diagnoses and symptoms yet still have very different outcomes of quality of life based on the psychosocial factors. His belief system and personality could impart low self-esteem and hopelessness. His support system as a child may not have provided the right learning interventions and family support needed to excel. In contrast, my belief system and personality could be to view my struggles in a positive light rather than as setbacks. My social factors may have included learning better coping skills for the symptoms and family support. Personally, the Biopsychosocial model makes sense to me because it allows us to see that while some things are out of our control, there are many things within our control. Smith (2002) notes the model makes people “more humanistic”, rather than a simple organism with a one fit all approach. Carl Jung is quoted as saying, “We cannot change unless we accept it.” In my experience, accepting often takes more work than it does to live in the diagnoses. It seems to be easier to place blame or feel disadvantaged than to accept the reality of life. Accepting means seeing the situation for what it is and embracing all that we are. When we as parents embrace all that we are, our children can feel as if they can accept all that they are, too. *Erica Sokol is the Program Director for NAMI DuPage, the DuPage County, IL chapter of the National Alliance on Mental Illness, America’s largest grassroots mental health organization. She oversees community outreach and hospital programming. Erica draws on her personal experience as a family member to fulfill the mission of NAMI Du Page as a peer organization. Her family history includes members who live with ADHD, Anxiety, Depression, Substance Dependence and Personality Disorders. Erica earned a Master of Science in Clinical Psychology from Benedictine University and also works part-time as a Licensed Professional Counselor at Fox Bend Counseling in Oswego, IL. Yoga is an active part of her life and she is in training for the 200 RYT yoga certificate. Erica enjoys volunteering with the Girl Scouts in Plainfield, IL, where she resides with her husband Jeff, daughters Lizzie and Tori, and their black lab Lucy.